This is a list of plants that have a culinary role as vegetables. 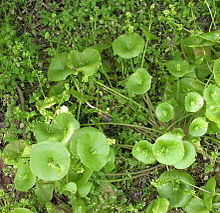 "Vegetable" can be used in several senses, including culinary, botanical and legal. 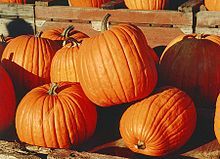 This list includes botanical fruits such as pumpkins, and does not include herbs, spices, cereals and most culinary fruits and culinary nuts. Edible fungi are not included in this list. Legal vegetables are defined for regulatory, tax and other purposes. An example would include the tomato, which is a botanical berry, but a culinary vegetable according to the United States. 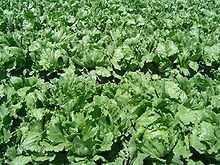 Iceberg lettuce field in northern Santa Barbara County. 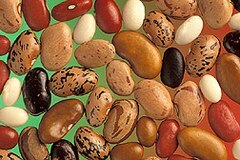 "Common bean", "kidney bean", "haricot bean", "pinto bean", "navy bean", and "green bean" are all varieties of the species Phaseolus vulgaris. 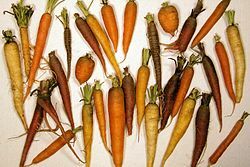 Carrots come in a variety of shapes, sizes and colors. 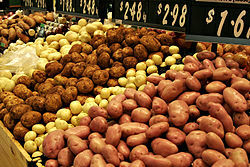 The potato is one of the world's staple foods. Caulerpa is a genus of edible seaweed. 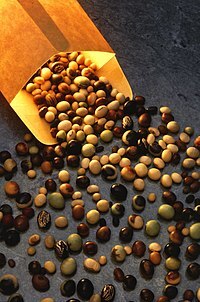 ^ Used dried or fresh in Chinese cuisine; see Meredith, Leda. "How to Sustainably Harvest and Eat Delicious Daylilies". Mother Earth News. Mother Earth News. Retrieved 8 July 2014. 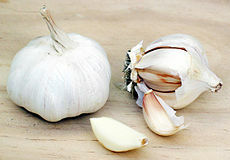 ^ Also known as the Egyptian Walking Onion due to its ability spread easily to other parts of gardens. ^ "Everyday Mysteries: Yam". Library of Congress, United States of America. 2011. This page was last edited on 29 March 2019, at 14:45 (UTC).